The People’s Campaign will be hosting a series of public meetings next week, with the events set to take place on Tuesday, January 17 at Clearwater Middle School in St. David’s; Thursday, January 19 at Allen Temple A.M.E. Church in Sandys, and Saturday, January 21 at St. Paul’s Centennial Hall in Hamilton. 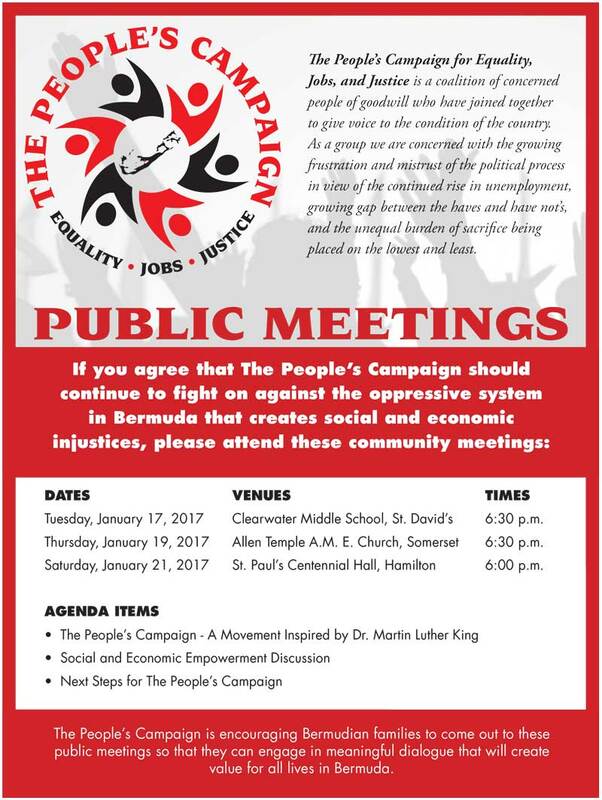 “If you agree that The People’s Campaign should continue to fight on against the oppressive system in Bermuda that creates social and economic injustices, please attend these community meetings. Are you planning to wind up then? Host meetings, complain when only a smattering of people show up, then hold a Press conference basically saying that Bermudians aren’t interested in saving themselves. No one in this island is oppressed. Syrians are oppressed. Venezuelans are oppresssed. North Koreans are oppressed. For the naysayers, list the laws that are oppressive. If one of your aims is jobs, why would you oppose a project that will provide locals with jobs in both near and longest term? How is an airport oppressive? Trim all the roadside weeds jobs = elbow grease instead of chemicals – paying jobs to make Bermuda look great again. This shrill use of words really is not helpful and anaesthetizes readers to the subject matter. You want to see oppressive systems check out China and its Uighurs or Myanmar and its Rohingya or maybe some of the central African republics and how they mutilate their little girls and rob their people of any opportunity to have a better life in freeedom and security and dignity. Leave inciting theatrics aside and try to have a mature conversation to move Bermuda forward–not divide it and drive it into the past–we are tired of the kiddie rhetoric. You weaken and cheapen the spirit of your cause and mock those with real world problems with such sloppy and off handed references and rhetoric as its hard to take you seriously. Re tool recalibrate your messages please. Maybe God will call Tweed to go set up a peoples campaign in one of your listed destinations….surely his work is needed more there than here , the US or the UK. as GOD is his shop steward ,leave it to GOD to sort out . Hypocrites….. “unequal burden of sacrifice being placed on the lowest and the least.” Are these not the same people you wanted to strike at the beginning of the year? i.e. go without pay!! No. they’re the people the strike stranded at bus stops. Oppression as in fostering or perpetuating a mindset or view that prevents people from realizing opportunity or potential? Which is exactly what the PLP/BIU/PC need their followers to see. Only way their bigotry and agendas work. I would love to see a list of the Committee and their goals as of date. Call a meeting outside the Session House for Monday at 10am. God, I am beyond tired of hearing about this group. A movement inspired by our party not getting elected and sour grapes. When are we next going to try and block the democratic process? Looking for someone to drive Tweddie to the airport on the 19th? They need to discuss the parade route through town on the way to the airport. I will be at the airport to ensure the door knob does not hit him on the out. public meetings?… you mean door to door don’t you? Maybe… those lot over there… there not doing anything…. and there church is fullah peopoo…. I am calling for ALL BERMUDIANS to stay away from these people`s campaign meetings for these people are problem makers and not PROBLEM SOLVERS!! Simply put all they do is try to instill fear when there is none. That equates to ‘”NOT THE BERMUDIAN WAY!!! Just sayin! Entrenched and deep seated. Read Glen Fubler’s last article and you will see no movement from those who only see the People’s Movement as oppressors. That is why his liberal door good ideas always fall on stony ground because those who hate the group never attend or reach out one hand to understand and they know that such hostile attitudes only fuel the situation. Are you kidding me? Bunch of jokers. If they want the rich to help more, how about the churches paying taxes like other businesses?